Over the last ten years, the decking industry has been revolutionised, and performance has been taken to a far higher level. Now, the highly attractive cutting-edge plastic decking looks just like real wood, and is 100% recyclable, which is a perfect option for those who care about the environment. A combination of wood fibres and plastic are also used in some composite decking materials. A decade ago, the materials used looked fake, but that has all changed now thanks to new manufacturing technology which has been able to duplicate the way the wood looks. There is a range of wood-lookalike plastic decking that runs from warm tropical woods to lookalike hand-designed interior floors. And this new form of decking comes without all the inconvenience and time-consuming upkeep, making consumers very content with practically maintenance-free decking. The state-of-the-art plastic decking range now offers an exciting spectrum of designs, patterns, colours, and thicknesses which can empower a perfect match or complement the rest of the décor. And top-of-the-range decking is not just colour coated, it is actually manufactured with the colour going completely through the boards; that way it will not be subject to splintering, fading or staining, and it can hide scratches. It is also crack and peel resistant, and will not wear like some alternatives. The plastic material also boasts a high level of mould resistance. Furthermore, because the materials are modified, they are also resistant to rot and insects. 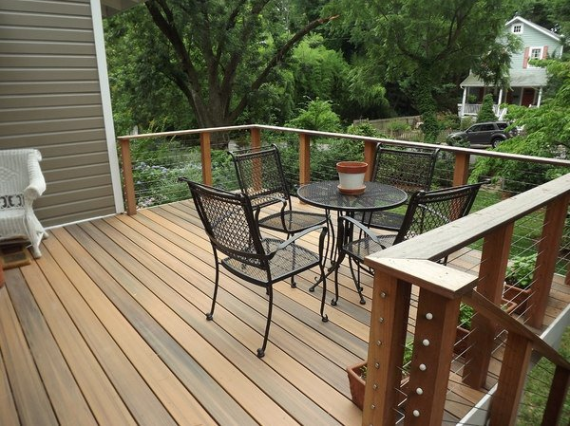 Many homeowners are concerned about how they can have their deck waterproofed, so when they find out about plastic decking material, they are relieved that their deck can be sheltered from wet weather and the resulting damage. This protection is made by placing the plastic decking below a full heat welded waterproof system. So whether it is hailing, snowing or raining, you are covered. When thinking about your options it is good to bare in mind that the quality of plastic decking is now second to none, does not look like plastic, and offers the sharp, unrivalled aesthetic that is not available with other decking materials. It is suitable for all ranges of budgets, and once you have it laid you have the piece of mind that you will not have to seal, stain, or sand it on a yearly basis like other materials.